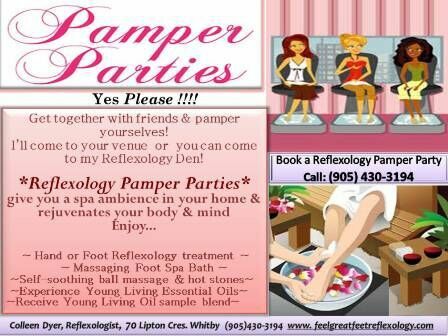 You can be a hostess of a Reflexology Pamper Party & get a FREE treatment for yourself! A Reflexology Taster Party is an event where you can get together with some friends and learn about reflexology and try it out. I will come to a venue of your choice and give a short talk about reflexology. Each person will then receive a taster treatment lasting 20 minutes. This is an ideal way to find out how it feels to receive reflexology and also a chance to ask me how reflexology may benefit you and help with your particular concerns.